The process of healing continues day by day in the twenty years since the tragic genocide in Rwanda. David Owasu, Founder of AH Kumasi in Ghana, traveled to Rwanda last year and introduced Attitudinal Healing to a group of friends in Kigali. After hearing about David’s experiences, an inspired university student named Mark Neeza Pluckton immediately contacted Attitudinal Healing International for support and guidance to begin the process of bringing Attitudinal Healing (AH) to Rwanda. Envisioning this as a tool for healing the deep wounds that remain in the wake of the country’s historic conflicts, Mark and others are now working toward integrating AH as an important part of the Annual Commemoration Ceremonies in April, 2016. 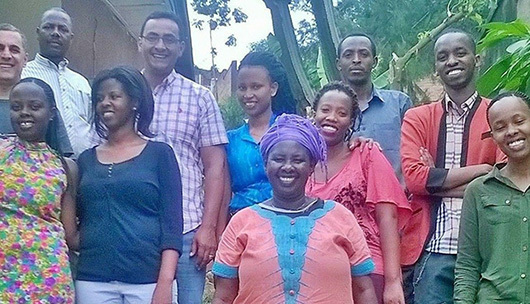 In less than one year, the AH Rwanda team has completed the Attitudinal Healing online trainings, formed a Board of Directors and submitted an application to be recognized as an official NGO in Rwanda. After receiving a small grant from AHI, the team wasted no time in organizing two days of introductory Attitudinal Healing seminars in Musanzi, a community located two-hours by bus from Kigali. They were amazed by the response. In four two-hour seminars, translated into the local language, presenters introduced 350 participants to the history and Principles of Attitudinal Healing, focusing on forgiveness. The AH Rwanda team is working hard to raise funds to print the AH Principles in local languages and to rent an office space where interested community members can meet and learn more about Attitudinal Healing. As a fund-raising project, they are designing T-shirts with the AH Principles, and “night clothes” with AH quotes to promote communication within the family. Join us in supporting AH Rwanda! The Centre for Attitudinal Healing - Perth in Western Australia continues to expand its Professional Development Program for diverse organizations across Western Australia. The Centre has been hired to provide services to government departments, major legal firms, judicial officers and clergy members, while also providing workshops for the general public. Company directors, professionals and support staff all participate in the Centre's workshops which focus on ways to avoid burnout, increase productivity, and heal depression and anxiety. 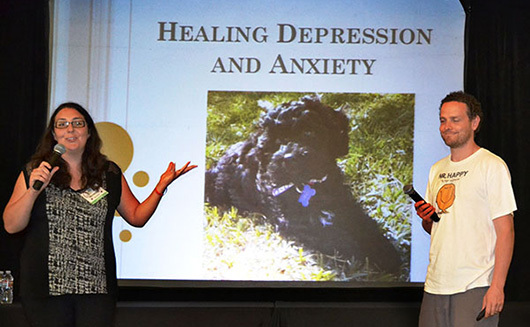 Innovative Attitudinal Healing workshops have also been adapted to serve professionals working in areas of high trauma. Participants are given an intensive course in neuroscience as well as practical AH tools for dealing with trauma in a professional environment. All proceeds from the professional workshops go directly to support the Centre's Refugee Children's Wilderness Programs at their Serpentine Retreat Centre. The beautiful coastal city of Dalian provided the perfect setting for AH China’s Third Annual Attitudinal Healing Workshop and Facilitator Training. 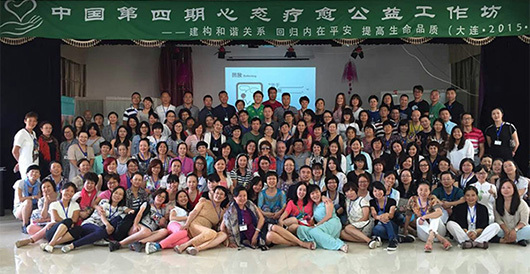 In August, organizer Quinghua Yan (Oliver) and a “dream team” of volunteers hosted 170 participants from 27 cities throughout China. Participants, ranging in age from 14 to 80, took Attitudinal Healing into their hearts, created lasting friendships and shared their visions for utilizing Attitudinal Healing in their workplaces and personal lives. Six new support groups and two new AH WeChat groups have been launched since the training. WeChat groups have access to A MiniCourse for Life, which was translated into Mandarin and released in August. 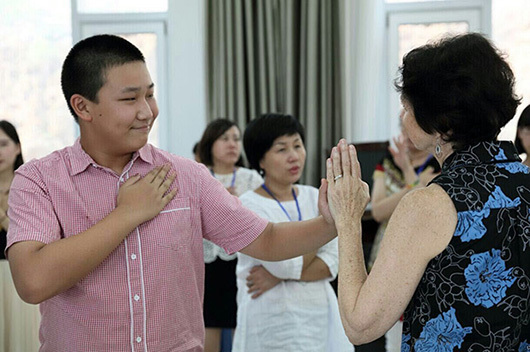 With the assistance of volunteer translators, Ni Hui (Nicole) and Quijai Chen (Garfield), AHI trainers Carolyn Smith, Joe Keery and Trish Ellis continue to work online with AH China. Each month they offer WeChat webinars to answer questions on AH concepts, and to support facilitators in their work as they adapt Attitudinal Healing to the needs of their Groups, families and communities. One of the things that brings great joy to AHI Founders, Gerald Jampolsky, M.D. and Diane Cirincione-Jampolsky, Ph.D. is connecting people with each other. 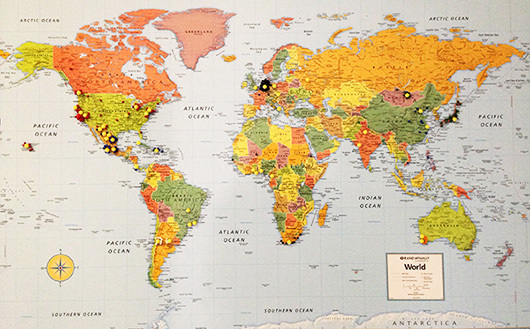 This year, they initiated quarterly online “Centers Connect” meetings to strengthen and inspire the AH Community. 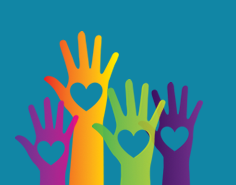 Through “Centers Connect” and regional online meetings, members of AH Centers and Groups share their personal experiences of Attitudinal Healing, learn about AH innovations and curriculum, and find creative ways to support mutual growth. For example, hundreds of AH participants across China communicate daily using the WeChat social media forum. In Africa, AH representatives from ten countries publish a regional newsletter together, highlighting the work of a different individual in each issue. In the U.S., existing Centers help emerging Centers navigate the non-profit application process. In Mexico, the Guadalajara Center adapted the Power to Choose youth program to the local culture and provides materials and training to other Spanish Speaking Centers. Visit the AHI website, find a Center or Group that touches your heart and let them know how you feel about their work through your support.